Happy Sunday! Don't you just love Sundays? There's something so calm about them -- I adore it. And on this particular Sunday, it truly feels like Spring has arrived! We had one very chilly day last week, but other than that, it has been all about warmer weather and lots of allergies. Definitely my least favorite part of Spring, but I'll take it if it means nicer temperatures! 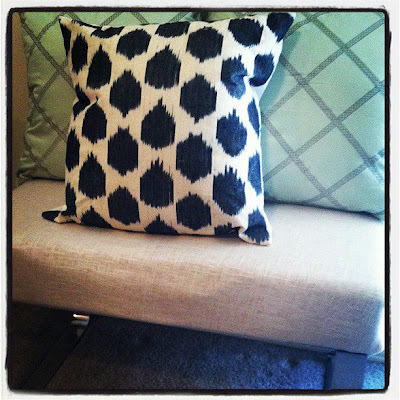 One of my favorite processes of decorating is layering fabrics and patterns. This is a small bench that I recovered a couple of weekends ago. I took the blue-jean-like color of the ikat print and found two pillows that had a beautiful robins-egg blue color with stripes of blue-jean-hues. The pillows were HomeGoods steals -- the back ones were $4.99 each, and the front was $12.99. Layering patterns can really add so much depth and texture to a room. 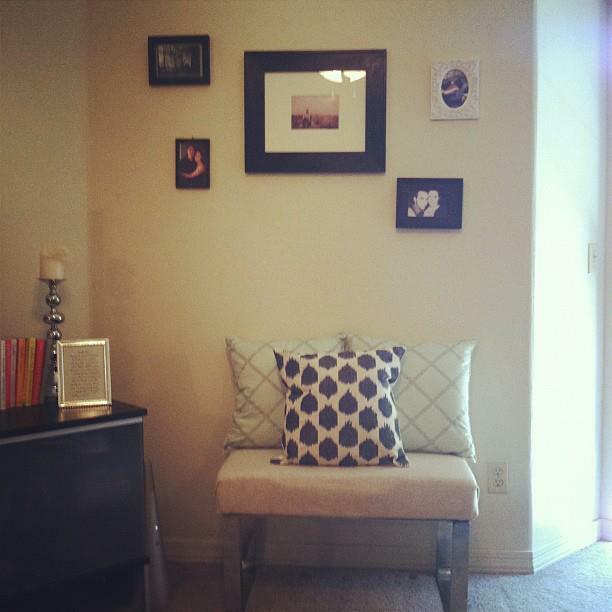 I have always loved throw pillows, but it was only very recently that I started to try my hand at mix-and-matching -- really getting bold with my choices and finding a way to add richness into my home. This photo is a great example of using texture to add complexity to a room. 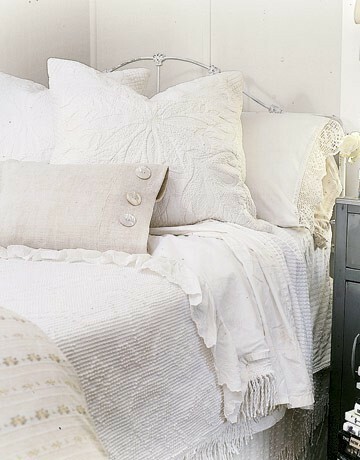 All of the bedding is based on a white color scheme, but there are lace-y accents, buttons, and striped finishes that really make this bed look luxurious and grand. 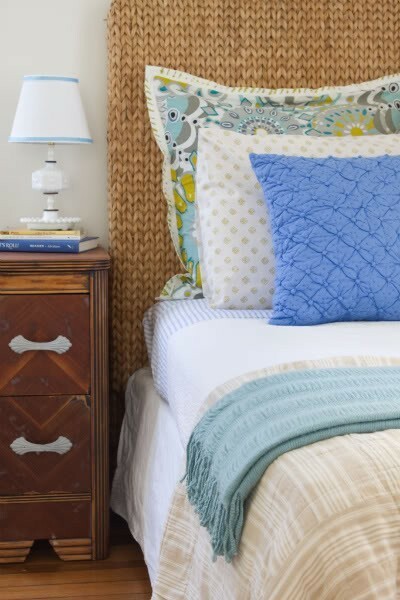 One of the most foolproof ways to intermix patterns is to have each pillow or textile use a color (even a very small spot of color) from the one it is closest to. In this photo, it moves down a line, from left to right -- the bolster pillow is cream, and the orange pillow has cream in it. The red pillow next to the orange plays off of the bits of red in the orange pillow. The next orange pillow plays off of the red bits in the predominantly red pillow. And the cream echoes both the ivory pillow at the far end of the sofa, but also the white bits in the orange pillow next to it. Symmetry, but interesting symmetry. 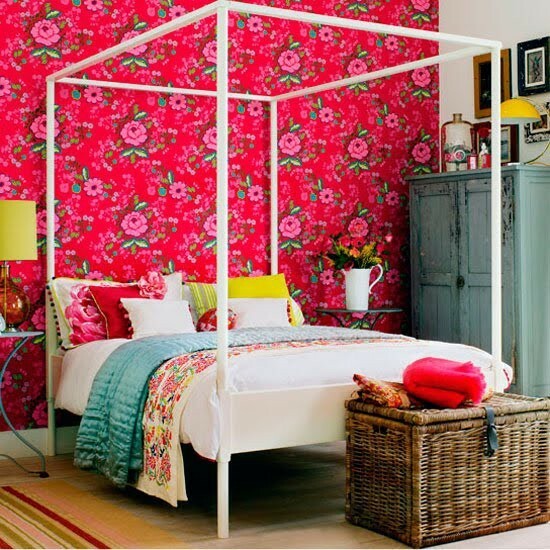 I really like how this bedroom's fabric colors are playing off of the wallpaper. 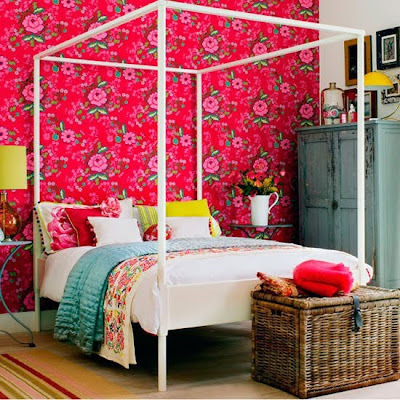 There are different hues of pinks and greens, and even a little bit of yellow thrown in there as an accent. I also appreciate how the pillows are arranged to look like a colorful headboard of sorts -- it adds even more of a pop against that delightful wallpaper. Black and white is reflected in this room, but in different patterns. The black and white pillow on the chair and the black and white cover on the bed unify and ground this space and allow for the other colors to take center stage without the room feeling outlandish or too mismatched. 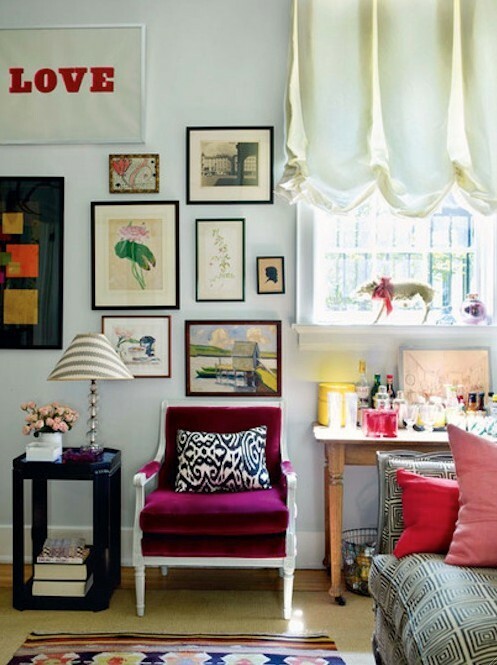 I love how in this room, colors are reverberated everywhere! The stripe-y bedspread looks perfect with the polka-dot pillow. The sky-blue color of the front throw pillow matches a book on the night stand; and the busily patterned pillow in the back looks picture perfect with the little stripes on the table lamp and the light blue of the throw blanket. All of these colors tie perfectly together with the headboard and the night stand. A very well-thought-out space. 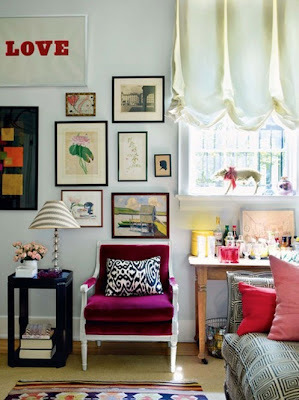 This is an absolutely lovely, punchy little space -- perfect for a little girl. The greens are happy and subtle, the yellows are sunny and bright, and the pinks are sweet but just the right amount of grown up. The color of the walls is neutral enough that these colors are the focal point of the room, not so much the wall behind them. I absolutely love this space. The upholstered headboard mixes fabulously with all of the echoing colors, and the patterns are a lovely combination of stripes, florals, and solids. 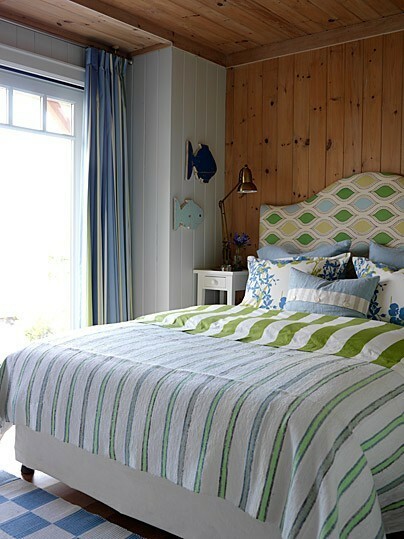 With the bed up against an exposed-paneling wall, it really makes the colors pop and makes a statement. Moving from left to right again, each pillow takes a color from its "friend." This mixed with the adorable window treatments and the accent color of the turquoise upholstery on the seat-bench makes the most charming little window seat I ever did see. Have you mastered the art of mixing patterns? What is your favorite color palette to work with when blending different designs?